Home ↔ Products ↔ Power Inductors - Always in Stock ↔ Helical Wound Inductors ↔ High Power Inductor E Series. Unpotted. 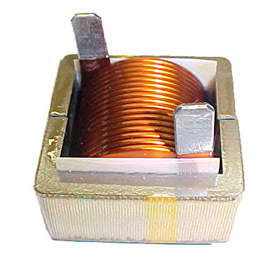 The CWS' ES, EK and E73040 Series of High Power Inductor and High Current Inductor are designed using Helical Winding (Helix Coil) in semi quasi planar structure to achieve lower DC resistance (DCR), lower AC resistance (skin effect loss), and high inductance. The core materials used are Distributed Air Gaps Compacted Cores from Magnetics, CSC and Micrometal. Both Gapped and UnGapped cores are used to extend the DC bias capability. LT SPICE model can be downloaded from the link LT Spice for E Series, LT SPICE for E Series,. Thermal model can be donwloaded from the link provided in the table below for each part # . These are unpotted inductors. For potted/encupsulated versions, please see our EES- and EEK-Series. The E Series High Power Inductor and High Current Inductors are capable of handling high DC bias current, high energy storage and high voltage swing due to higher mass and higher saturation flux densities of the cores used. Various Mounting configuration with pre-tinned leads for direct connection. Mounting Spacers ( PN: EKES-SP001) can be bonded or placed under the cores to rest the inductor flat into the PCB during manufacturing, if needed. The table below shows the types of cores used in each of the part number. The ES Series and the E70340 Series are using Sendust or KoolMu core type and is suitable for swinging chokes, energy storage filter inductor in SMPS with high ripple current, in-line noise filters with large AC voltage swing, unidirectional drive application such as pulse transformer and flyback transformer. The E70340-0013 and E70340-004 are using Gapped iron powder core and and used in similar application where lower cost is needed. Sendust or KoolMu has good frequency response up to 1 Mhz, lower core losses, and will operate at a lower temperature. The EK Series are for those application requiring small inductance drop when a high DC current (DC bias) is flowing into the inductor. The EK series are built using Mega Flux cores with higher saturation flux density. The EK Mega Flux version is suitable for Output Ripple filtering, High Power Output Chokes and High Current Inductor where a good DC bias characteristics is desired. The core loss of the Sendust/Koolmu and Mega Flux are very similiar at frequency below 300 Khz. Mega Flux version cost a little more than the others. Mega Flux cores are not suitable for application over 750 Khz, and has a much higher core loss than the Koolmu/Sendust cores. The part PDF drawing has the DC Bias Current versus Inductance table. It is not necessary that Inductors with higher Inductance versus DC Bias Current is better in all cases. This is because Energy Storage in a filter is defined as 1/2 x [L] x [Sq I], where [L] is the inductance and [Sq I] is the square of the current flowing into the Inductor. For energy storage filtering application, having a good DC bias is not always a desired feature. When the current flow into the inductor increases, the amount of energy stored increased to the square of the current [Sq I], and if the inductance [L] does not drop when the current increase, the energy stored maybe too high and could potentially cause a circuit to blow up. For such energy storage filtering application such as Input Filter ( Phi or butterworth or chebyshev filters), or the Boost Inductor, the ES Series using Koolmu or Sendust is usually the desired choice. However, every application is different and the design engineer must balance the trade offs. Industrial High Current Filter Inductors, Switching Regulator Inductor, In-Line Noise Filters, Pulse Transformer, Fly Back Transformer, Differential Mode Choke, Boost Power Factor Correction Choke and Welding Machine Output Inductor.